AERIAL photographer Mike Page continues to get some great shots. These latest photos show just how wet the Yare Valley is after a sodden start to 2013. From a WW perspective the first one also shows just how splendidly isolated The Beauchamp Arms is. That’s Carleton Beck winding its way down to the river in the foreground. The road to the pub is shown by the avenue of poplars. Buckenham Marshes lie on the other bank. And with Katy W’s help, we think that the light-coloured building almost on the horizon is Hassingham Church. This next one downriver is even wetter. We’re now looking across the marshes towards Cantley with the sugar works looking oddly insignificant on the far left. Thanks as ever to Mike for his generosity in sharing his photos. * Mike Page’s website can be found here. The hall is hidden behind trees from this direction as far as I can tell. Thanks to you and Mike for sharing these photos - I know someone who walked the Way the week before last, and it's a real insight into the conditions! Katy I think you're absolutely right. I'll change the text accordingly. 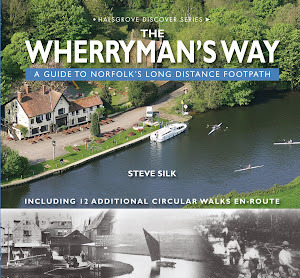 The blog started as a way of publicising Steve's book on the Wherryman's Way which was published by Halsgrove in 2010. Then it became a way of updating Wherryman's Way walkers. More recently it has spread its wings to the wider Broads. Around 1000 people take a look every month. Steve is now writing a second book provisionally called Riverside Norwich. You can follow his progress on that project here. The Wherryman's Way runs for 35 miles between Norwich and Great Yarmouth, following the route the wherries used to take along the rivers Wensum and Yare. Six years ago I was sitting in the White Horse, Chedgrave wondering why no-one had written a book about it. A few pints later my mates had convinced me I was the man. It was published in May 2010. Work repairing flood defences means sections of the walk can be closed for months at a time. Get the latest info here. Bixley: St Wandregesilius– a revival?